I wrote a post on Macassar last year and rather than steal yet another post from last year's challenge I thought I'd have a go at writing something a bit different. We still serve Tree of Life church in Macassar and spend a lot of our time in the community and we still love it! So in that regard nothing has changed and as a church we are still passionate about winning the community for Christ. Tree of Life meets on Sundays at Macassar High school so it seems appropriate to focus on education in Macassar. Education is generally a bit of a hot potato in South Africa and nowhere are the difficulties more pronounced than in Macassar. Because Macassar is located within the Helderberg it is considered by the Education Dept to be in a wealthy area and not in need of any extra finances or resources. This is an unfortunate accident of birth! Macassar's schools desperately need more govt investment but they just won't get it. This brings me to the picture which was taken just over a week ago. 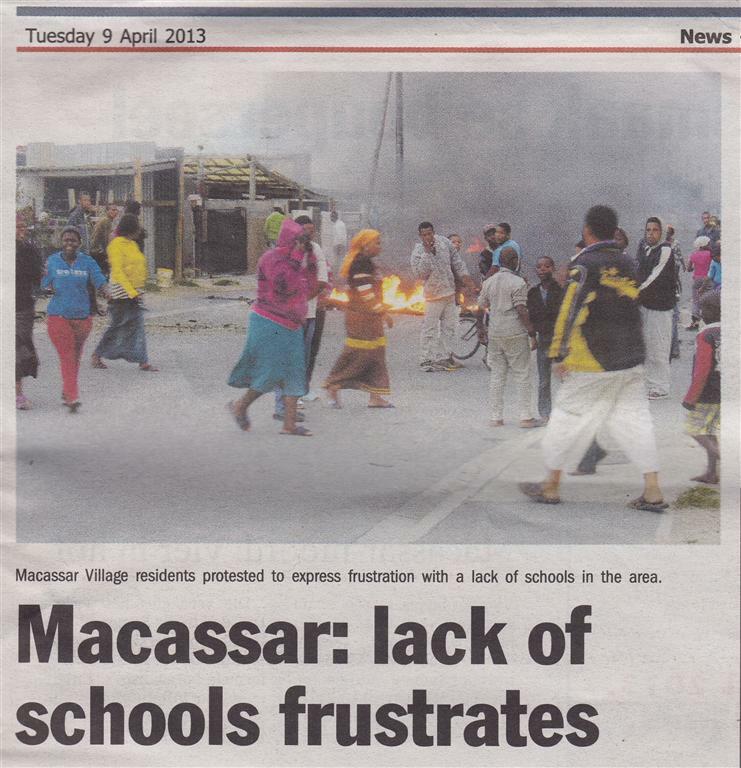 It shows residents in Macassar Village protesting over their lack of access to schools. Macassar village is on the far end of the town and getting to either of the high schools is quite a trek. But it's not all doom and gloom in Macassar. Recent matric results were very encouraging with both high schools achieving a higher pass rate than the provincial average of 82,8%. Zandvliet High had a pass rate of 88.5%, an 8% improvement on its pass rate of the previous year, while Macassar High achieved a pass rate of 87.5%. An article in the local press shows just how much progress the Macassar schools have made because they are now out performing some of the bigger helderberg schools. This can only be good news for Macassar! Blessings up on the people of Macassar! And blessings up on Tree of Life.